In the 1920's, there was a steel truss bridge that carried Macy Street over the Los Angeles River. However the bridge was old, vulnerable to damage when the river flooded, and required traffic to stop for trains on both sides of the bridge. 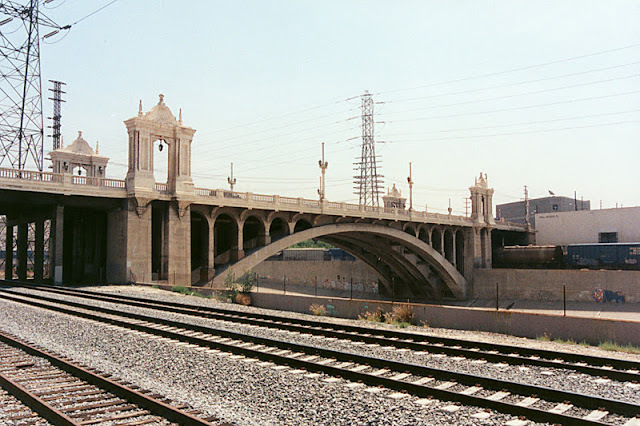 The City of Los Angeles decided to replace this bridge, along with several other river crossings in the downtown area, with viaducts that included beautiful, reinforced concrete deck arches over the Los Angeles River. Macy Street was particularly significant to California residents as it was part of El Camino Real, the road that carried travelers from San Diego to Sonoma (about 600 miles) when California was part of Spain. That may explain why the new bridge (completed in 1926) was designed in the Spanish Baroque style, with handsome porticos consisting of spiral columns and decorated capitals supporting a cornice carrying seashells and the seal of Los Angeles. These architectural features were preserved when the bridge was retrofitted in 1995 to protect it from earthquakes. The viaduct is 1270 (390 m) long, 71 ft (22 m) wide, and spans the river in a single 215 ft (65 m) arch. Merrill Butler, the city engineer was responsible for the design and the Atkinson-Spicer Company won the contract to build the bridge with a bid of $325,000. The name of the bridge was changed from Macy Street Viaduct (after an area businessman and politician) to the Cesar E. Chavez Avenue Viaduct in 1995 to honor the civil rights activist. Los Angeles River Bridges: Cesar E. Chavez Avenue Viaduct by Mark Yashinsky is licensed under a Creative Commons Attribution-NonCommercial-ShareAlike 3.0 United States License.